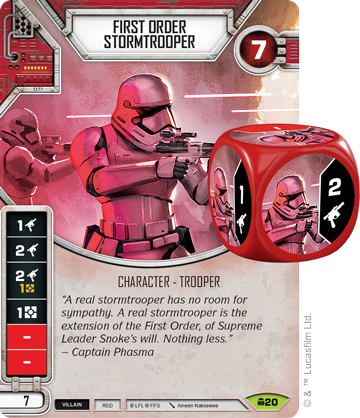 Home › Star Wars Destiny: Convergence Booster Box! 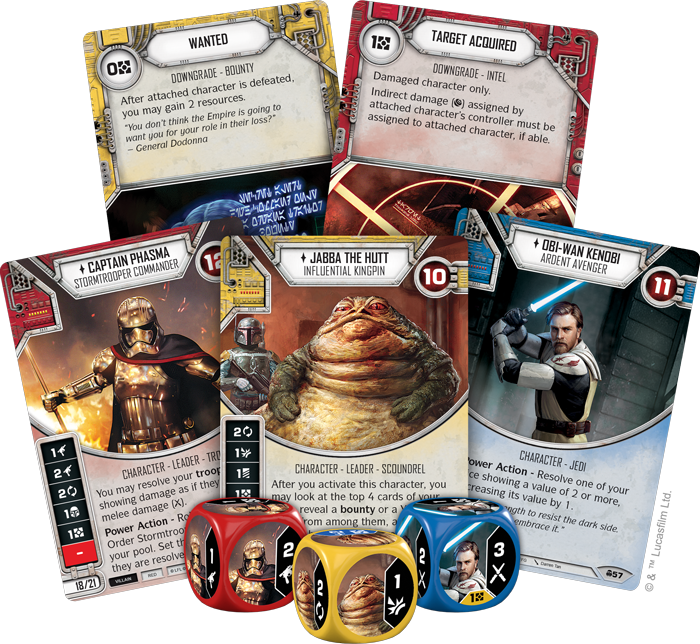 s the start of a new block of sets, Convergence introduces plenty of new themes, and even a new card type, into Star Wars: Destiny! Look for a focus on character subtypes like Jedi, trooper, and leader, as well as an emphasis on new plots and powerful downgrades to hinder your foes! Since the launch of Star Wars: Destiny, upgrades have always been an essential part of deckbuilding. By attaching these cards to your character, you can roll out additional dice every turn and receive other helpful benefits. 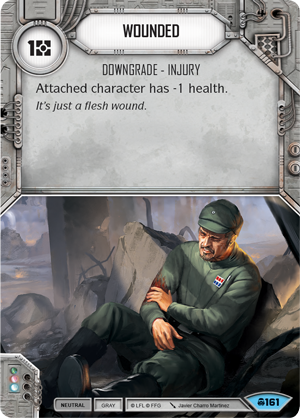 Convergence introduces a dark reflection to these enhancements in the form of downgrades—cards that you attach to your opponent’s characters. A separate card type from upgrades, every character can have up to three downgrades attached to them. Naturally, these downgrades hinder your opponent in some way, with cards likeWounded (Convergence, 161) permanently reducing a character’s health. 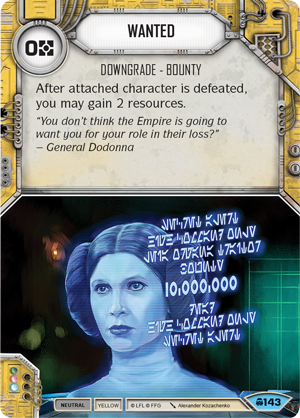 Even the most stalwart characters can fall to downgrades, and each color has these cards in their own flavor. For example, Yellow receives a cavalcade of bounties in Convergence. 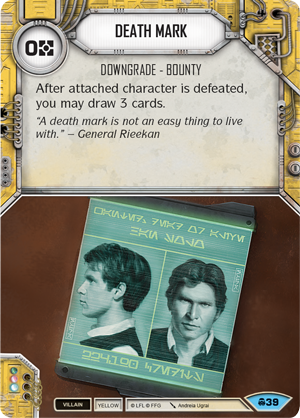 These are downgrades that provide a bonus when the attached character is defeated, a helpful reward for bringing in your target. Wanted (Convergence, 143) provides a windfall of resources, while Death Mark (Convergence, 39) lets you draw three cards when you defeat the attached character. Naturally, you could attach both of these downgrades to your primary target, giving you a massive boost of momentum when you fulfill the contract. Look for these bounties and more within Convergence! As you might expect, plenty of other cards synergize with these bounties. The notorius gangster Jabba the Hutt (Convergence, 36) is not a crime lord you want to cross, as he has little trouble making your life difficult. 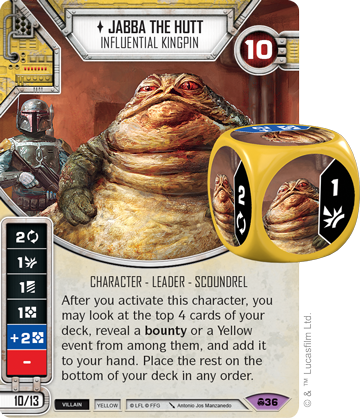 If you include the Influential Kingpin on your team, you can search the top four cards of your deck to grab a bounty or Yellow event every time you activate Jabba, giving you plenty of opportunities downgrade your opponent’s characters and plenty of bonuses when your bounty hunters defeat them! Convergence places a heavy emphasis on what kind of characters you're including on your team, going deeper then Red, Blue, or Yellow, and hero, villain, or neutral. 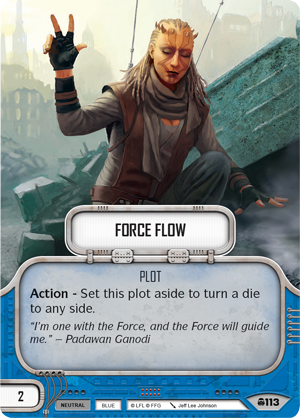 Are you using mystic Jedi harnessing the power of the Force, or shifty scoundrels using their wit and skills to outsmart their foes? Or maybe you're relying on the pure firepower of troopers like the terrifying Captain Phasma (Convergence, 18). 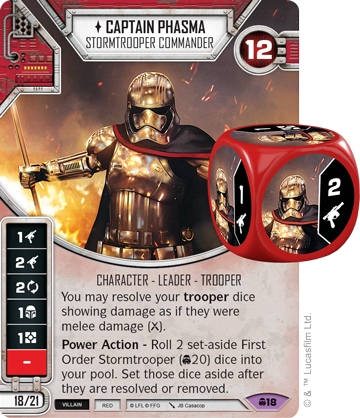 The Stormtrooper Commander can keep your troopers in line by unifying their damage types, but also always has an army of First Order Stormtroopers (Convergence, 20) (one of several reprints from the Awakenings block with new art in the set) backing her up, using a Power Action to roll in two of their dice every turn. With two damage sides on her own die, you can quickly overwhelm your opponent with a well-trained army. 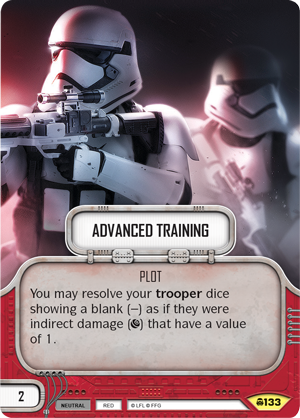 You can even increase your trooper’s accuracy by adding the Advanced Training (Convergence, 133) plot, turning blanks into indirect damage, and ensuring every roll will be valuable. 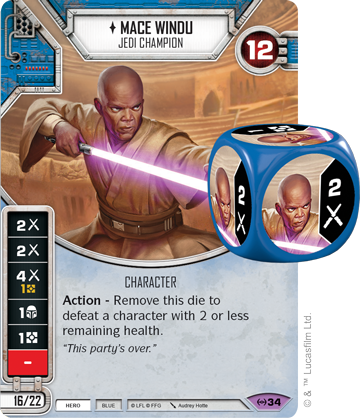 While Convergence allows you to overwhelm your foe with the firepower of the First Order, you can also take a more meditative approach and build a deck focusing on the ancient Jedi Knights of the Old Republic. What better way to start than with a true Master of the Council? 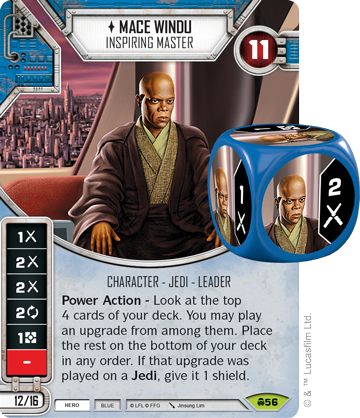 Mace Windu, Inspiring Master (Convergence, 56) enters Convergencewith three melee damage sides and a Power Action that allows you to search the top four cards of your deck for an upgrade and play it! While this obviously lets you outfit your characters with new weapons and abilities, they get an additional boost if they are a Jedi, in the form of an extra shield. This is a great way to gain action efficiency, playing important cards while building the defenses of your characters. 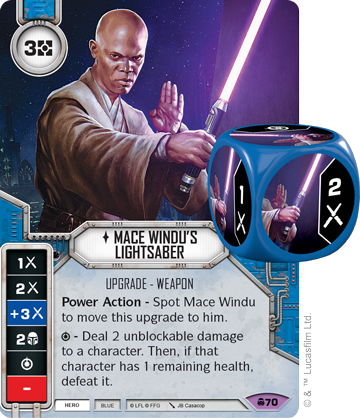 Perhaps one of the upgrades you’ll include in your deck is Mace Windu’s Lightsaber (Convergence, 70), the iconic purple blade that you can wield to defeat any who stand in your way. With two sides showing melee damage and a third showing modified melee damage, the lightsaber is the perfect companion for Mace Windu, and can always be moved to him as a Power Action. Its special ability is a callback to the original Empire at War version of Mace (Empire at War, 34), allowing you to deal two unblockable damage to a character and perform a finishing blow if they have one health left. With a bevy of damage, Mace Windu’s Lightsaber is one of the most potent weapons in the game. As a new base set, Convergence will feature two new starter sets launching alongside it, providing the perfect introduction to Star Wars: Destiny! 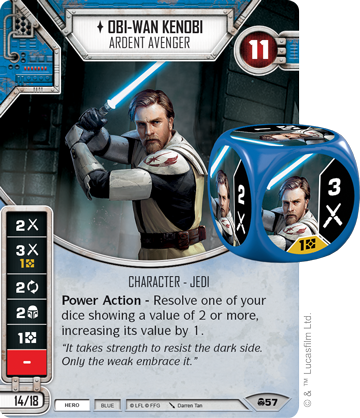 While the Rey and Kylo Ren starter sets of the Awakenings block were rooted in the sequel trilogy, and the Legacies starter sets featured heroes and villains of the original trilogy, the Convergence starter sets see us travelling all the way back to the Clone Wars with the Obi-Wan Kenobi and General Grievous starter sets! 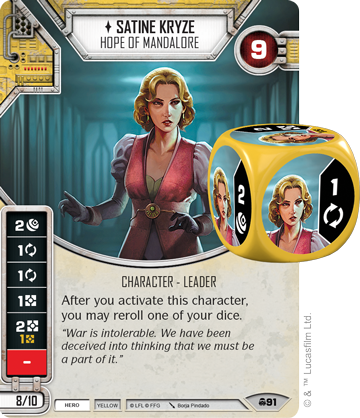 The Obi-Wan Kenobi Starter Set sees an elite version of the famous Clone Wars General (Convergence, 57) teaming up with Duchess Satine Kryze of Mandalore (Convergence, 91) in a 24-card deck featuring Blue and Yellow cards, including the Force Flow (Convergence, 113) plot! Obi-Wan Kenobi will be your primary damage dealer, with two die sides showing melee damage that can be boosted by his Power Action. You'll have plenty to look forward to here as well, including Blue cards that can boost Obi-Wan's damage output, as well as upgrades and equipment that grant additional bonuses when you spot a Jedi character! Meanwhile, Satine Kryze takes a more supportive roll, granting you the ability to reroll one of your dice after you activate her. This starter set also offers Yellow events and upgrades that can grant you resources, give you the ability to control the battle through dice manipulation, and provide additional bonuses when you spot a leader character! Opposing the forces of the Old Republic is General Grievous (Convergence, 21) and two terrifying Commando Droids (Convergence, 19)! 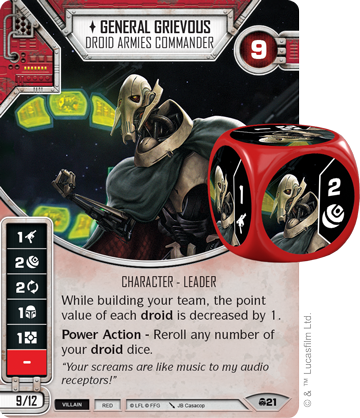 General Grievous provides a discount to droid characters when you're building your team, and with his Power Action, you can reroll any number of your droiddice. 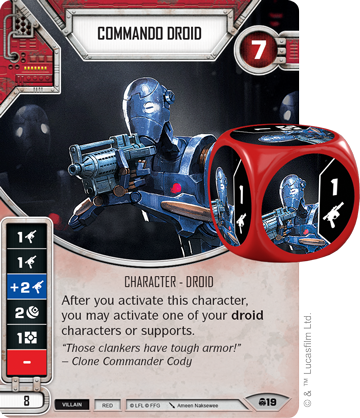 The Commando Droids in turn synergize with other droid characters and supports, allowing you to activate an additional droid when you roll them in! The rest of the deck is dedicated to efficiency, with plenty of Red supports, events, and upgrades dedicated to pulverizing your enemies! With the Obi-Wan Kenobi and General Grievous starter sets, you have all the tools you need to fulfill your destiny!